A year ago Buchwald & Bolm investigated some alleged iron-catalysed coupling reactions and found that copper present in minute quantities as a contaminant was the true catalyst (blog here). In a similar case, Lauterbach et al. in a new publication (DOI) argue that several gold-catalyzed coupling reactions reported in the recent literature are in fact co-catalyzed by hidden palladium. Gold just cannot do it on its own. The coupling reaction in question is the Sonogashira reaction between an aryl halide (ArX) and an alkyne (R-CC-H) that is catalysed by a combination of palladium and copper. In it Pd(I) supplies the oxidized L2XPdAr complex and Cu(I) supplies the acetylide and after a transmetallation step and a reductive elimination step the product R-CC-Ar forms. Now gold(I) is isoelectronic with Pd(I) and could actually replace both Pd and Cu. This idea was tested out by Arellano et al. in 2007 (DOI) and by Li et al. in 2008 (DOI) with respectable results. But Lauterbach is not convinced as in his hands a simple gold-only Sonogashira ends up with a meager 2% yield. Something is going on and some more testing is done. If the reaction sequence in the catalytic cycle is oxidative addition followed by transmetallation then a reaction between PhI and AuCl(PPh3) should result in oxidative addition but it does not. 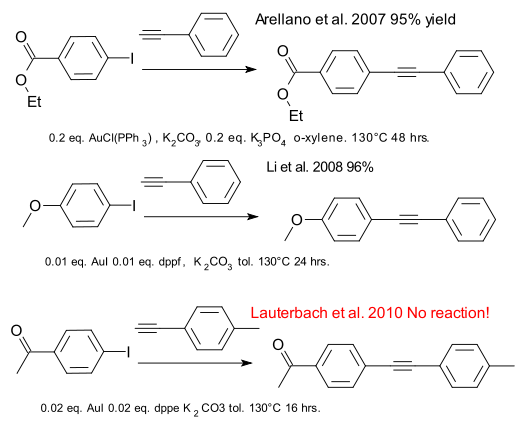 Likewise if the cycle is initiated by transmetallation the compound (PPh3)AuCC-Ar should be oxidized by ArI but again this reaction does not work. What does work on the other hand is the addition of small amounts of palladium. This makes the conclusion inescapable that in the so-called gold-catalysed Sonogashira hidden palladium (as contaminant in gold or base or solvent) is the true catalyst with gold just replacing copper. In this way the palladium-free Sonogashira reaction takes on a new level of complexity just like the so-called copper-free Sonogashira reported on in an earlier blog.